News of yet another lost and unprepared novice in our North Shore Mountains, with North Shore Rescue finding the needle in the haystack and saving another life, prompts reflection on both the attraction and peril of living on the edge of wilderness. What does it all mean? What lessons should we learn? I think of several issues which go beyond lifesaving, to the essential economic model underlying one of the key attractions of life in this community: the North Shore Mountains. Why are growing numbers of the unprepared getting into trouble? Because the wilderness is right there at the end of a 20 minute bus ride; because it is unique; because in an overcrowded world it is virtually unpopulated; because it is spectacular; because it is unblemished; and yes, because it is dangerous. Many visitors simply want to SEE it and EXPERIENCE it! It is our own super natural version of the Grand Canyon or Niagara Falls. With surging prosperity among crowded Pacific Rim countries, this is a tremendous marketing opportunity – no secret to Nancy Stibbard with her extended Capilano Canyon attraction or Stuart McLaughlin and his multi-faceted Grouse Mountain complex. On either flank, the Province of British Columbia has two provincial parks: Cypress and Mount Seymour. And we would be remiss if we did not include the District of North Vancouver’s popular Fromme Mountain. Aside from the clear pleasure of “simply looking,” the sheer range of activities carried on within these five centres is astonishing, including skiing (downhill and cross country), hiking, treetop adventures, snowshoeing, grinding one’s way up the mountain as a test of fitness, logging demonstrations, ice skating, shopping for handicrafts, gifts and gear, fine dining, environmental walks, mountain biking, watching grizzly bears, cliff adventures, mountaineering, back country trekking, Olympic competitions, activity lessons, zip lining, gondola rides, rentals, tubing, climbing a tall windmill, getting a summer job, and simply walking. These activities grow and grow, some with little impact on the environment, some with quite a bit. For the future, let us not underestimate the potential of simple low-impact viewing of our protected natural environment. When we look northward from the peaks, we see the Canadian wild, stretching hundreds of miles into the distance, pretty much unchanged from what it has been for thousands of years. A supernatural moment indeed. Our international tourism interests, our local recreational interests, and our natural environment interests can occasionally collide. It will take wise stewardship and lots of meetings to ensure that all three interests are fairly served. The commercial owners and operators, the Province, Parks Branch, Metro Vancouver, local Municipalities, as well as the many active non-profit groups such as the (Environmental) Friends of Cypress and the Hollyburn Heritage Society (1930s ski lodge restoration) have so far been skillful at maintaining a consensus and balancing all of these interests. But let us not pretend the policy decisions and tradeoffs will get easier in the years ahead. West Vancouver’s well-known spa (Absolute Spa) and hotel (Century Plaza Hotel) entrepreneurs Wendy Lisogar-Cocchia and Sergio Cocchia have re-directed a significant portion of their energies and network to helping families deal with the perplexing issue of autism. They are motivated, in part, by having an autistic child themselves. What is it? When I was first elected, I did not recognize the phrase. However I soon learned how an autistic child can impact a family. Since autism presents itself in varying degrees, from mild to acute, it is termed a “spectrum” disorder. So the impact on the child and family can vary from case to case. In 2012, the American Centres for Disease Control and Prevention reported autism affected one in 54 boys and one in 252 girls. In 2014, they revised these estimates to one in 42 boys and one in 189 girls. (Boys are four times more likely than girls to have autism.) The centre characterized the rapid increase as “a pressing health crisis that must be prioritized at the national level.” Canadian experience is similar. Early intervention can make a huge difference in a child’s development. With treatment, the goal is to “grow out” of autism in a child’s later years. Here is where Wendy and Sergio’s project comes in. With strong support from BC Housing (Minister Rich Coleman), their own pocket books, and generous contributions from others, the $35 million Pacific Autism Family Centre project broke ground at a ceremony on Sea Island in December. I was there. While most of us stayed dry under a much-needed tent, dignitaries ploughed through delta mud and tossed piles of gravel in the air for the television cameras. The Pacific Autism Family Centre will be a centre of excellence for individuals with ASD and their families. Its core will be a Knowledge Centre bringing together resources for research, information, learning, assessment, treatment and support. The central 60,000–square-foot building has been designed to meet the special needs of those with ASD and their families. Calming, family-friendly spaces with soft lighting will house clinics, labs, classrooms, observation rooms, research spaces, libraries, and information kiosks. The project aims to provide services and support from eight electronically inter-connected hubs across the province. They will provide “one-stop-shopping” for desperate families looking to navigate the confusing and often contradictory sea of information being pumped out on the internet. The centre aspires to discover innovative solutions that might otherwise never come to light when expertise is concentrated within the typically independent silos of research, mental health, and childhood development. In 2013, Sergio Cocchia received the Order of BC for his philanthropic contributions. Mr. Cocchia has served as president of the board of the Mediated Learning Academy and the Variety Learning Centre, an independent school that serves special children with more than 30 different diagnoses and learning problems. In 2010, Mr. Cocchia received an honorary Doctor of Laws from the Justice Institute of BC. He has also received the Queen Elizabeth II Diamond Jubilee Medal, the BC Community Achievement Award and the Children with Intestinal and Liver Disorders Foundation Humanitarian Award. Congratulations to West Vancouverites Wendy and Sergio for addressing this vital family need in B.C. Our recently rebadged Royal Canadian Marine Search and Rescue or RCM-SAR is a volunteer organization standing by to help mariners in distress 24-7, 365 days a year. They operate from more than 40 rescue stations on our complex Pacific and interior coastlines. They are called out more than 600 times a year – driving most often into high winds, high seas, and low temperatures. RCM-SAR’s specialized rescue vessels operate in one of the most intricate coastlines in the world. As a result of B.C.’s hundreds of fjords, islands, and passageways, our Pacific Ocean coastline is about twice as long as that of the United States, even if we add Alaska and Hawaii. RCM-SAR volunteers must be prepared to leave their jobs and families with a 15-minute response time to help people in trouble on the water, storms and squalls notwithstanding. RCM-SAR, built on the English Lifeboat Societies model, typically operates highly equipped rigid-hull inflatables which can skip over the waves at 40 knots with a dozen or so people on board. This contrasts sharply with the American approach, built around the US Coast Guard (USCG). While USCG operates smaller rigid-hull inflatables too, checking aids to navigation, pollution, and unsafe boating practices as well as boaters in trouble, the USCG is a full-time professional organization and a branch of the US military. It might respond to your call with a powerful keel boat mounting a machine gun on the bow. One of RCM-SAR’s newer fast-response vessels is based at Station 1 in Horseshoe Bay, West Vancouver. It calls about 36 active volunteers; is typically engaged in 80 missions a year; spends 5,000 person-hours annually at sea; with a vessel on the water in rescue operations around 600 hours a year. Recently, I was asked to participate in a ceremony involving a government grant and sod-turning for the construction of a brand new RCM-SAR training centre in East Sooke, west of Victoria. I was impressed that Canadian Forces SAR personnel from the Comox search and rescue aircraft base were present, as well as local police representatives, all playing a role in Canada’s SAR network on the West Coast. 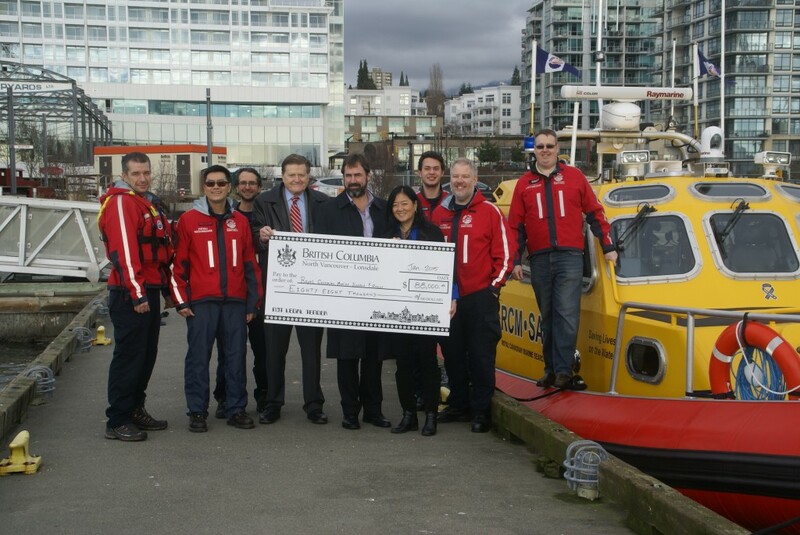 Even more recently, I participated in the ceremonial gift of $88,000 of provincial “gaming money” to RCM-SAR #2 in North Vancouver. 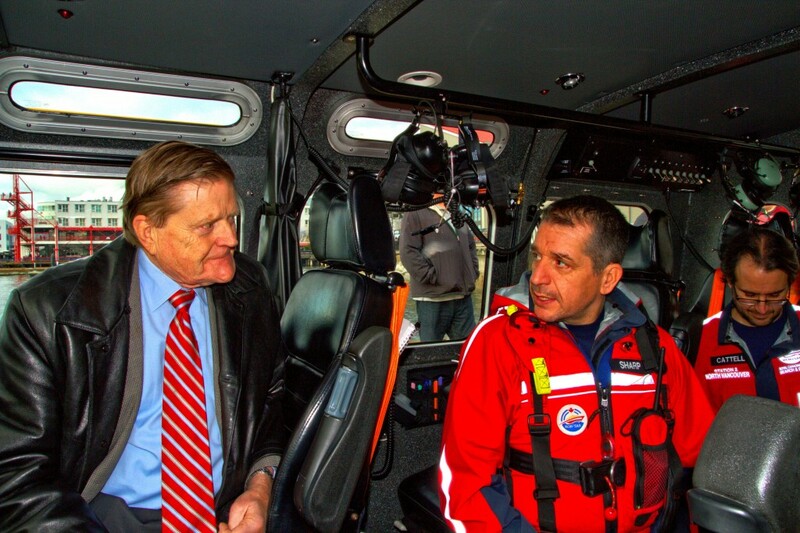 They proudly showed MLAs their new fast response vessel: a rigid hull type with an enclosed cabin, twin diesel power and jet propulsion, acquired at a cost of $500,000. Many members felt that raising $1 million to build two new boats of this type would be a lofty if not impossible goal. However, the local marine, shipping and shipyard industry, recognizing the need for rescue infrastructure, dug into its pockets and has helped RCM-SAR #2 generously. Thanks to RCM-SAR’s hundreds of trained and capable volunteers, the rapidly growing thousands of commercial, hobby, and commuting persons on the uncertain waters of British Columbia – many of them amateurs not yet graduated from a Power Squadron course — can be assured that should things go wrong, capable rescue is usually not too far away. Almost nine years ago, a friend from Terrace told me I should meet a physician named Julio who had “discovered a cure for AIDS.” While not sure of the Terrace provenance, I made the call. 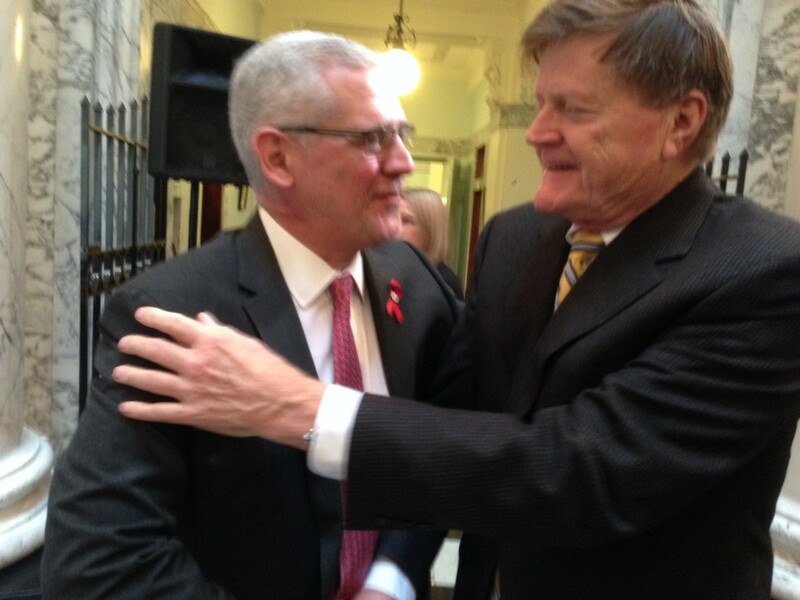 It was the start of my friendship with Dr. Julio Montaner, the Vancouver medical doctor and HIV-AIDS researcher who, I predict, will receive the Nobel Prize in medicine for developing the therapy and the strategy which will conquer the worldwide AIDS epidemic. Julio has since become a global medical celebrity, in Washington meeting Bill Clinton one week and in Beijing the next, meeting the boss of China’s health system. My minor role has been to help promote his work within the Government in British Columbia. The combination of Health Ministry backing, B.C.’s universal health system, and our unmatched public health micro data base – combined with solid support from Providence Health Care Authority — have facilitated Julio proving the stunning effectiveness of his approach. Today, Julio Montaner’s “seek and treat” strategy has become the standard model for locating carriers of the HIV virus, so that they can be treated with a daily cocktail of pharmaceuticals which effectively stops virus transmission and radically lowers virus loading in the infected so they can lead normal lives. I was motivated to help Julio by a personal experience with HIV/AIDS shortly after returning to Vancouver in 1990. A new and frightening epidemic was sweeping our city. My wife, a nurse, helped care for a family member who was diagnosed with HIV/AIDS. Shirley was compassionate, dedicated and undeterred by the severity and unknowns of the illness. She nursed him closely and lovingly until he died a short two weeks later. This was the epidemic which Julio set out to understand and conquer. He succeeded. About two months ago, the Right Honourable David Johnston, Governor General of Canada, announced 13 new Officers of the Order of Canada (O.C). Julio was one of them. Established by Queen Elizabeth, the Order of Canada recognizes outstanding achievement, dedication to the community and service to the nation. Dr. Montaner surely qualifies. Julio and his team are now working on applying the “seek and treat” model to other world-wide virus-born epidemics. Stay tuned! And congratulations Julio Montaner O.C.